You are here: Home » Blog » PR: Bacon’s Hams Take to the Air! The Roger Bacon Academy ham radio operators from left: Zach Potter, Elizabeth Eskander, Samantha Stearns, Nevin Wetherill at the 2011 Coastal Carolina Air Show. 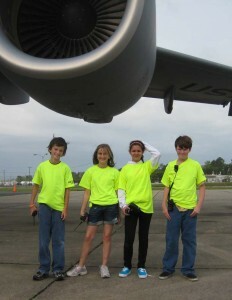 WILMINGTON INTERNATIONAL AIRPORT: April 26, 2011 –Student ham radio operators from The Roger Bacon Academy went on the air at the annual Coastal Carolina Air Show to help provide emergency communication backup and assist first responders in their communication needs. Licensed radio operators and their call signs were Zach Potter, KK4BJU, Elizabeth Eskander, KK4BJT, and Samantha Stearns, KK4BJS – all 6th graders in the school’s ham radio club. They were joined by Nevin Wetherill, KJ4WLP who attends Topsail Middle School. From 7:00 a.m. until noon, the hams assisted in pedestrian traffic control and with the SKYWARN system which was very active due to the severe weather in the area. At noon the Air Show officials canceled the program due to the high winds, but the RBA volunteer hams enjoyed a full morning’s excitement. “Ham radio has opened up a whole new world of interest for Zack,” exclaimed mother Rebecca Potter. Newly licensed ham Samantha Stearns said, “Ham radio has helped me overcome my fear of talking in public, and I have enjoyed learning about other cultures.” Elizabeth Eskander commented that actually using the technology was helpful in learning the physics and science that was involved. The Roger Bacon Academy staff building a ham “shack” for the ham radio club on the campus of Charter Day School. Bill Wetherill, N2WG, has volunteered countless hours into supervising the club and conducting lessons for the students so they can pass the examinations for their FCC radio operator’s licenses. “The license exams cover the FCC laws about radio communications as well as the electronic principals involved in radio communications,” he said. “These kids are amazing, and I’m really looking forward to our next set of license courses,” he added. Wetherill said that one of the kid’s first contacts was a ham in Chile and that lit a real spark in the group. “Baker [school founder , Baker Mitchell, K4BAG] has been a ham since the 1950’s and has constructed a radio room on campus for the ham club,” said Wetherill. “This will give the kids a real boost to have their own ‘shack’ as hams call their equipment rooms,” he said. In an emergency such as a hurricane or other disaster, the kids realize that cell phones, telephones, and the internet may all be put out of service. Hams with their long-range battery-driven radios may be the only surviving means of communications, and these students intend to be ready. The Roger Bacon Academy Superintendent Mark Cramer operates the school ham radio at the 2010 Emergency Field Day. Each year, hams across the country participate in a weekend-long “Emergency Field Day” where they go to campsites or open areas and erect antennas, set up their radio stations, and use generators or batteries to communicate all over the country. 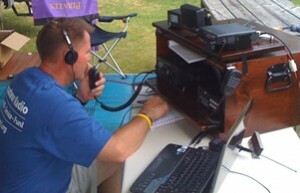 School Superintendent Mark Cramer, N4NLC, operated the school’s radio at the 2010 field day last summer.